One thing business owners and leaders tend to misinterpret is the term ‘Issues List’ when they are using the Entrepreneurial Operating System (EOS). In order to move understand, we need to redefine our definition of “issues”. For most people, the natural reaction in their brain is to think of bad things once the word issue is used. Instead, you need to visualise it as somewhere to park all of the topics you need to solve in your business – positive or negative. People are your most valuable business resource. You can have the best idea, product or service; you can be well funded, have great cash flow and be positioned in the right market, however if you don’t have the right people, you’re won’t make your vision come true. Your people need to match your core values, have the right skills and have the right attitude. In order to make sure you’ve got the right people in the right seats, you need the right structure for your business. 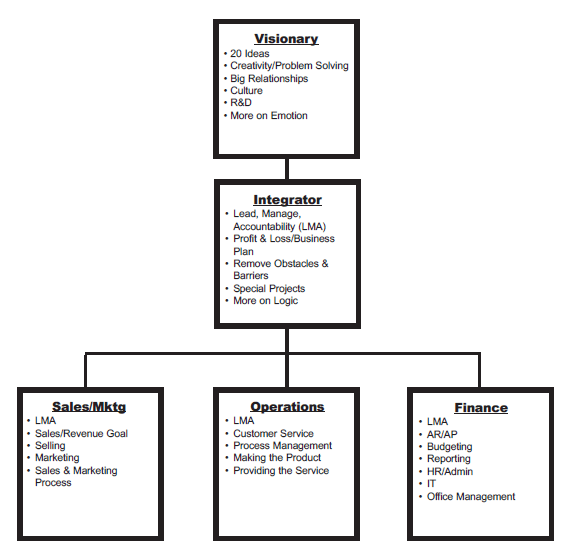 A fundamental tool of The Entrepreneurial Operating System™ (EOS) is have an Accountability Chart.